As well as having enclosed nuns, the Carmelite Family includes sisters who are 'apostolic', which means that they are involved in active service in the world. Rather than living in enclosed monasteries that have limited contact with the outside world, these members of the 'Third Order Regular' are involved in a wide range of apostolates, often working in parishes, clinics, advice centres, and chaplaincies in schools, hospitals, prisons, nursing homes and universities. Some sisters are involved in education, and others in political campaigning for justice and peace. The sisters are often referred to as nuns, and nuns are referred to by the title of 'sister', but strictly speaking a nun is enclosed in a monastery whereas an apostolic sister is active 'in the world'. work among the financially poorest people in the world. For many centuries the enclosed life of a nun was the only option available to women wanting to dedicate themselves to God's service as 'religious'. In the 16th and 17th centuries, pioneering women such as Mary Ward in England established religious communities that were not restricted by enclosure, at the service of those in need, especially children and the sick. Overcoming initial resistance and suspicion from the hierarchy of the Church, these women gradually received canonical recognition. Within the Carmelite Family the first 'apostolic sisters' emerged from the Third Order (the lay branch of the Carmelite Family). They were lay women living in common and taking vows. These groups of women developed particularly in Italy in the 17th and 18th centuries, feeling the need to put their faith into active service of others. In the 19th and 20th centuries other Institutes and Congregrations of Carmelite women were established, allowing women to make vows of poverty, chastity and obedience, lived out in communities serving the poor, the young, the elderly, the sick and the marginalised. Today there are 14 Institutes and Congregations of Carmelite Sisters affiliated to the Carmelite Order (Ancient Observance) and active in many different countries. There are similar groups associated with the Discalced Carmelite Order. Many of the founders of institutes and congregations within the Carmelite Family were women of outstanding courage and holiness. A number of them have been declared "Blessed" or "Saint", including Maria Teresa Scrilli, Maria Crocifissa Curcio, and Maria Candelaria (for further information on these figures click here). One of the Carmelite Order's congregations of sisters was established in Britain, and remains active here today with communities in York and Birmingham. The Corpus Christi Carmelite Sisters were founded by Mother Mary Ellerker (Clare Perrins) in 1908. They spread from the Midlands of England to the West Indies, and now have a strong presence there as well as in the United States and Liberia. They were affiliated to the Carmelite Order in 1927. The sisters are engaged in many different forms of apostolate, including parish ministry, prison chaplaincy, hospital visiting, and religious education. Click here to visit the website of the Corpus Christi Carmelites. 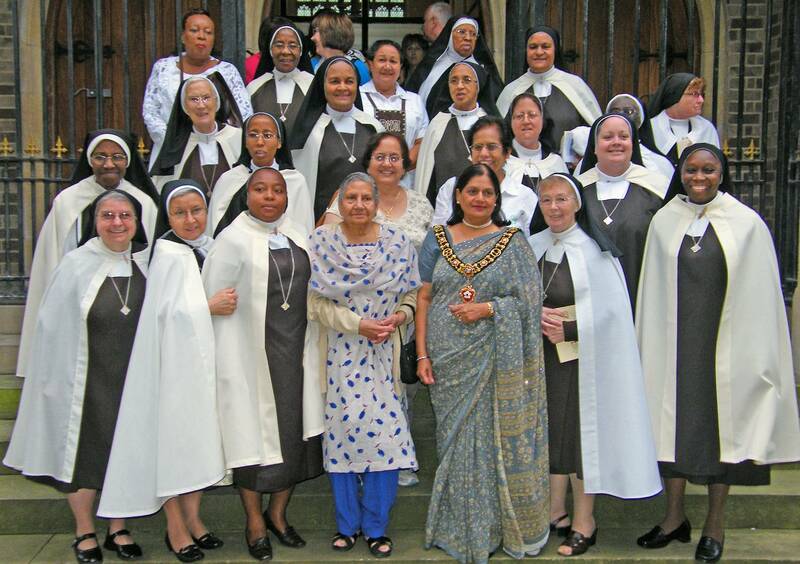 To read an account of the Sisters' centenary celebrations in Leicester, please click here. in the presence of the Lord Mayor of Leicester. In addition to the Corpus Christi Carmelites, in the 1970s and 80s there were sisters from one of the Spanish congregations affiliated to the Order living and working at Aylesford Priory. In 2004 a new congregation of sisters with links to the Discalced Carmelite Order, the Community of Our Lady of Walsingham, was established in Westminster Archdiocese. For more information about the sisters and their different congregations worldwide, visit the website of the Carmelite Curia.